Hello and welcome to the Salon’s May Newsletter! We open with Accidents with one of the Salon’s favourite actors, George Du Sel, making his directorial debut in our hallowed edifice. You will be treated to four exciting little stories with a 15-minute intermission. To begin with, the versatile Catrina Helsby will take you on a New York subway train in her performance of Robert Fox’s A Fable. A young man encounters a pretty maiden…. with her mother in tow. You´ll become witness to a strange love story which might leave you a little incredulous at the end, but – stranger things have happened. Love is in the air. I am quite certain that you will go into the intermission with a big smile on your face. Have a drink! In our final scene we leave this reality and trail into the forest of Athens, the forest of William Shakespeare’s A Midsummer Night’s Dream. Fairies rule this make-believe biosphere: Oberon foremost with his mischievous helper Puck at his side. Four lovers have made their way into this wood. Lysander & Hermia, Demetrius & Helena. Two couples in a magical forest – hormones running high! That calls for a love potion (didn’t we have that before?). Oberon steps up and benevolently tries to fix the mismatches with his magic. Puck however who is to carry out the plan –shall we say semi-maliciously? – makes a bit of a mess of it. No harm done, though, we are in a fairy-tale after all. The man shall have his mare again and all shall be well. With this lovely bit of Shakespeare we let you out into the night (or the bar). The director is anxious to know if good old William still has an audience. After all we are commemorating 400 years of the bard’s demise this year. Let George know when you see him. 6 – 10 May Nightly at 8pm – Sunday: 7pm. 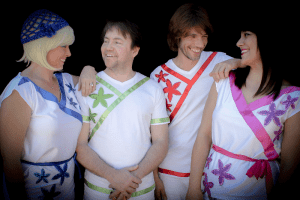 The 14th and 15th of the month see the return of The ABBA Experience – need I write more? I trust you all managed to see the superb production of “Jesus Christ Superstar”…? It was very well received and deservedly so in my humble opinion….although I did hear of someone who upon exiting the auditorium remarked upon how sad the ending was…!! Anyway April has five very promising shows coming up and the fun kicks off on Friday April 1st with tributes to ROBBIE WILLIAMS & MADONNA! Once again that talented boyo from The Land of Song – Ricky Lavazza of Wales – will take to our stage and give his own slant on the hit songs of Robbie Williams. Ricky’s rich vocals and his easy-going demeanour will make this a Tribute Night to remember….especially so in the company of Jordana. Her tribute to Madonna earler this year was a great treat for fans of “Madge”! From the 8th to the 13th of the month you will be able to see the Salon’s production of that hilarious TV series, ARE YOU BEING SERVED? After the huge success of ‘Allo, ‘Allo! last year Peter Brooks again directs a BBC classic. This version, especially written for the stage by the original T.V. scriptwriters David Croft and Jeremy Lloyd is – of course! – full of double entendres and innuendo. Peter is being constantly asked who will be playing the characters created for television. Usually it’s “Who will be playing Mrs Slocombe ?” Well, it’s the wonderful Sheila Wohlmuth aided and abetted by the welcome return of Talk Radio Europe’s Hannah Murray as sidekick, Miss Brahms. The shop staff include Anthony Grantham, Terry Horton, Simon Ellingham, Trevor Cooper and Graham Cherry with Terry King as Mr Humphries. It was quite difficult to decide who would play young Mr. Grace so there are three……Albert Doody, Arthur Hill and David Radford known affectionately as “The Three Graces”. Salon technicians Mark (who also appears as a shop customer), Simon, Alex and Trina have created two wonderful sets: first, the shop floor and, for Act Two, the hotel. Friends of the Theatre Association, now with 500 members! recently launched FOTA FUN group! This is aimed at encouraging young people to join. On Saturday a fun, highly enjoyable Treasure Hunt organised by Simon de la Mare and Kirsty Dennis attracted a big crowd of participants and despite the rain they all had a huge amount of fun.So….join FOTA if not already a member! With trips of all kinds and a monthly Lunch Club you make friends and enjoy yourselves…and support the theatre. The FOTA desk at the Salon Varietes will be open on a Saturday 12 – 2pm as well as Mon, Wed, Fri. For further information ring Val Williams, tel 952 584 268. 1. Meet the twenties’ Flapper Girl of every man’s dream….and a figment of the imagination she really is! The lovely Phoebe Floyer plays Polly Perkins in the hallucinating mind of Tim Westerby on his daughter’s wedding day. Mix in the grand-parents struggling with, respectively, a tight collar stud and a tight corset and the result is a fiendishly clever farce that gets madder and funnier as it goes along. Yes, this Ray Cooney farce, “There Goes The Bride!” definitely gets madder and funnier as it goes along. Salon favourite, David Vincent, leads a strong cast, directed by another Salon stalwart, Peter Brooks. Friday 22nd – Wednesday 27th January. Nightly at 8pm except Sunday 7pm. 2. Do YOU have the X FACTOR? Featuring: MOULIN ROUGE, MAMMA MIA!, JOSEPH AND THE AMAZING TECHNICOLOR DREAMCOAT, NEVER FORGET (TAKE THAT), FOOTLOOSE, and more! So, if you’re exploding with talent and charisma – AUDITION! Bring: 2 contrasting songs on CD, USB or Mobile, plus dancewear. Girls, please bring heels. CUDECA is holding a Charity Choir Event at the Salon Varietes Theatre, Fuengirola, on Friday 27 November 8pm. Three choirs, both adult and children, Funky Vocals, Banana Studios and the Choir Andaluz, will be singing traditional Christmas Carols. Come and support this wonderful charity! The show will contain an Impromptu Party and many more surprises! The theatre’s connection with CUDECA goes back many years to 1989 when Jackie Travis, a founder member of CUDECA, directed and starred in a show called “Zip!” This was followed by a production of “Gypsy” during which show a Cake Day made 72,000 pesetas and a raffle made 78,000 pesetas. The total of 150,000 pesetas – about €900 – was then presented to Jackie Travis and Joan Hunt by Brian Ford, the then president of FOTA. (Friends of the Theatre Association.) FOTA was also able to give €2,000 to CUDECA from proceeds from this year’s Anniversary Concert at Mijas Auditorium. Let’s keep up the good work with a full house on Friday! The Salon Varietes’ own Christmas revue, “Home For Christmas!” is on at the theatre from Friday 4 December to Tuesday 8 December and promises to get you into that Christmas mood with all the traditional Carols to sing along to. It’s a family show ideal for children from 7 to 70…and beyond! The story line concerns a small matter of matrimonial friction at the North Pole as Christmas approaches. It seems Santa Claus – played by that Salon comedy favourite, Trevor Cooper – has upset Mrs Claus because he (Santa) will NOT be “Home for Christmas” …as is usual… of course! So it’s up to the elves to put things right. There’s a great cast of singers and loads of fun for kids and adults alike!! Come and imbibe that Christmas spirit at the Salon – it’s non-alcoholic but just as intoxicating! From all at the Salon. Hello and welcome to the Salon’s June Newsletter! On to June 6th the music of the 60’s is brought to life by “Echoes of the 60’s”, a trio of entertainers consisting of Mark Connor, Michelle Daniels and Ron Howells, the latter of whom plays a mean guitar! With great vocals, stunning costumes, state of the art lighting and sound, the music will either take you right back to that well-loved era or introduce you to an amazing set of sounds which changed and shaped a generation. There is too a massive video screen showing original footage of the artistes painstakingly lip-synced to the show. A show full of music and humour with audience participation OBLIGATORY! Should be a night to remember! And on to June 13th…in the Mijas Auditorium! 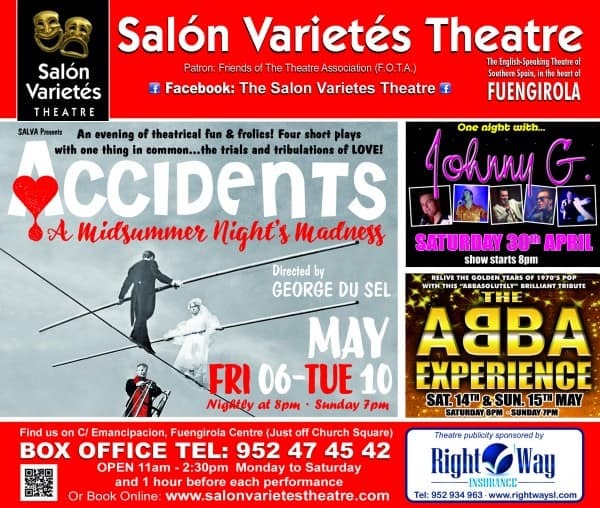 A week later don’t miss the Salon´s 30th Anniversary Concert, one fantastic night featuring over 80 very talented singers, dancers & actors, led by some of the Costa Del Sol’s most popular professional entertainers. 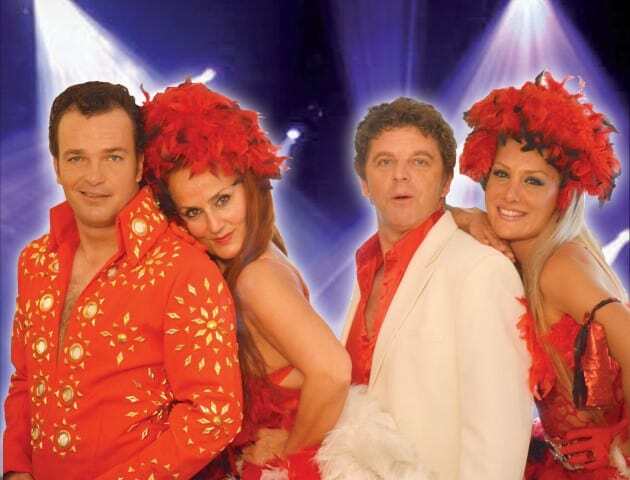 Together they will perform excerpts from 12 different shows in a 3-Act extravaganza under the stars in Mijas! The line-up includes the best of musical theatre with pieces from no less than 8 West End hit shows, as well as tributes to some of the biggest names in music history including Bruno Mars, Abba, Queen, Frozen and more! Have a great summer! The next season gets under way in September with the Jersey Boys, a play: The Memory of Water and Ballet Flamenco! is back! In June you will have a chance to enjoy excerpts from this fabulous musical which was staged in its entirety at the Salon Varietes in March when the ever-popular local entertainer, Ricky Lavazza took the leading role under the direction of Peter Mitchell. Needless to say this brilliant production was another sell-out with standing ovations every night. 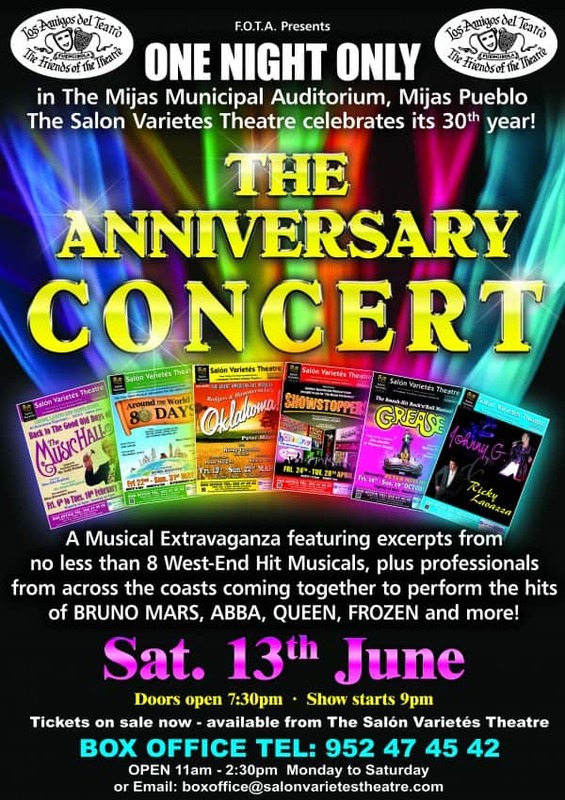 Now, the original cast amongst whom are Salon favourites Catrina Helsby, Owain Griffiths, Oliver Leiva, Mark Ramsay, Chris Beckett and Sandra Lilleywhite to name but a few, will be gracing the Mijas Auditorium on June 13th for the Salon’s 30th Anniversary Concert. So, if you missed Ricky and Co first time around or you enjoyed it so much you’d love to see an encore, you will be able to experience a spectacular reprise of this magical Rodgers & Hammerstein classic at the Salon’s 30th Anniversary Concert in Mijas. Preparations are well under way…. 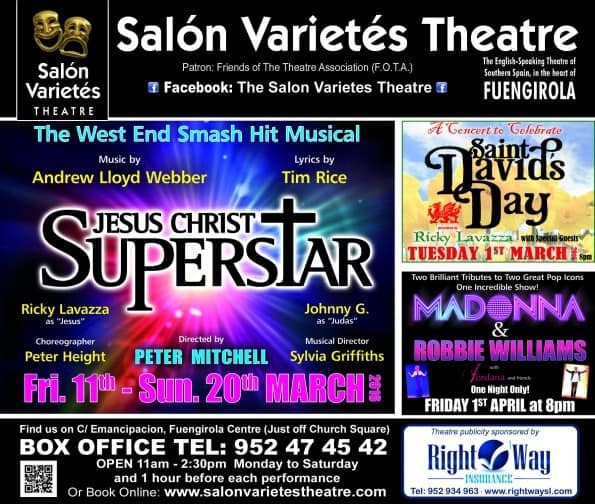 the concert looks to be one of the biggest fund-raising events ever to be staged in the history of the Salon Varietes and will feature excerpts from some of this season’s biggest and best-loved productions. Allocated the mammoth task of organising this event is John Gale, perhaps better known on the coast as popular showman “Johnny G”. John has been liaising with the individual directors and together they have carefully selected the highlights of each featured production to make this a true extravaganza of theatre entertainment. All you ‘Music Hall’ fans will be glad to know that Siân Hopkins and her team will be inviting you to go ‘Down The Strand’ and ‘Roll out the Barrel’ with a bit of ‘London Pride’ as they present snippets from the Salon’s favourite annual ‘Old-Time Music Hall’. Unfortunately your worthy chairman Mr. Colin Pollard will be unable to attend. However, due to the marvel of modern technology, he will still be introducing the rabble via satellite link. Siân herself is, as well, preparing a very special performance that could possibly make you go a little ‘ga-ga’!! All of Peter Mitchell’s big musicals will be featured. The cast of the hugely popular sell-out production of ‘Grease’ will reunite to give you all the best-loved hits from that rock and roll musical. As already mentioned Ricky Lavazza will be leading rousing renditions of the well- known songs from the recent, stunning success that was Oklahoma! There will also be excerpts from other productions such as Henrik Hagensen’s May musical ‘Around The World In 80 Days’ due to be staged at the Salon later this month. Some of the professional entertainers who appeared at the Salon this season have also volunteered their time for the concert. Johnny G, as concert producer and the male lead in “Grease”, will obviously be there and will also perform songs from his own shows, possibly even his new “Bruno Mars” Tribute! Ricky Lavazza, as well as heading up the ‘Oklahoma ‘ section, will give us a bit of ‘Tom Jones’ & “Robbie Williams”. The Showaddywaddy and ABBA tributes will be there too so be ready to sing and clap along! and the ‘Forever Divas’ duo will be giving us their soothing harmonies. 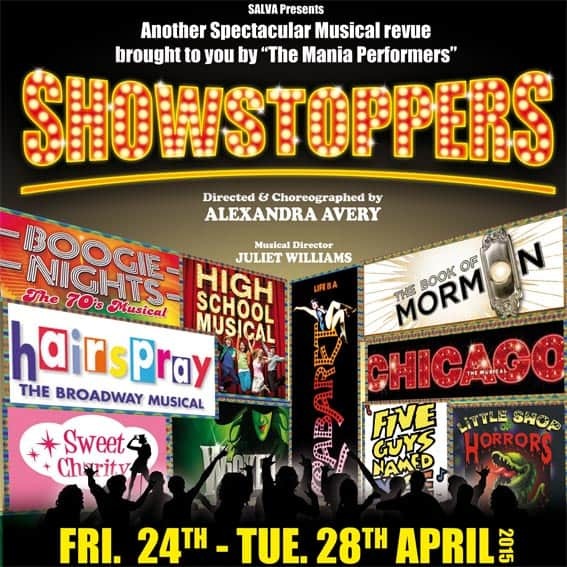 All of this will be gelled together by Alexandra Avery’s “Mania Performers” giving you ‘Showstopping’ extracts from West-End hit musicals such as ‘Cabaret’, ‘Chicago’, and ‘Hairspray’. Alexandra herself, along with Johnny G. and Ricky will be MCing the event. Hello and welcome to the Salon’s April Newsletter! It’s time to tell you all about the SALVA programme for April. Don’t miss…well, you can’t miss…. (see photo! )…Yvette, Rene and Mimi! They´ll be in ‘ALLO, ‘ALLO! at the Salon 10-15 April. 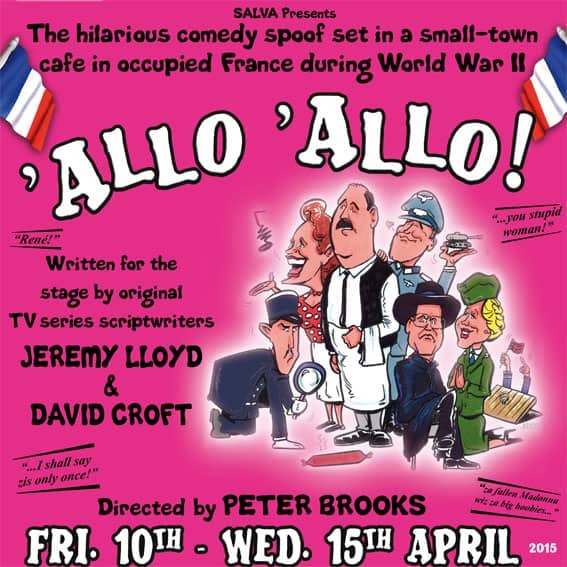 This is a comedy based on the famous BBC sitcom of the same name set in Rene’s cafe in Occupied France during World War II. Rene has to deal with – in no particular order – the German Army, the Gestapo, two amorous waitresses (and therefore Rene’s wife…. ), the Resistance, a cockatoo seller and ……Adolf Hitler in various shapes and sizes! Sausages, cockatoos, a painting of a top-heavy Madonna, banging upstairs, inflating a rubber Hitler…yes, all your favourite innuendoes are served up chez Rene. With Francis Butler as Rene and Talk Radio Europe´s Hannah Murray as Helga! ‘ALLO,’ALLO! is on 10-15 April. C’est beaucoup de laughs! ONE NIGHT IN LAS VEGAS! Expect all the classic songs from those two giants of popular music as the Costa’s top showmen, Johnny G and Ricky Lavazza, perform this dazzling tribute. And, fellas, completing that Vegas atmosphere are two stunning Vegas showgirls…. On for three nights only: 17, 18, 19 April. 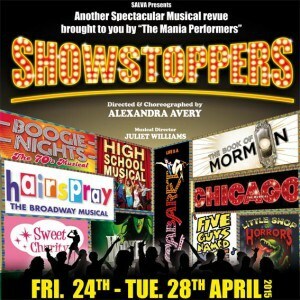 A mere week later, ladies and gentlemen…and….it’s… SHOWSTOPPERS! After the successful productions of MOVIE MANIA and MUSICAL MANIA, the fabulously talented cast known as the Mania Performers have another hit on their hands! Hold on to your seats as they take you on a magical, musical journey from London to Broadway! Join them as they recreate the spectacular sensations CHICAGO, BOOK OF MORMON and SWEET CHARITY, feel the power of CABARET, WICKED and BLOOD BROTHERS, the adrenalin of HIGH SCHOOL MUSICAL, HAIRSPRAY and 5 GUYS NAMED MOE and the vibrancy of BOOGIE NIGHTS and LITTLE SHOP OF HORRORS! And, not strictly April but strictly May 1st sees Jordana’s MADONNA TRIBUTE at the Salon with all those great songs and, ladies, two husky male dancers! There is also a momentous event taking place in June. 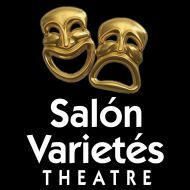 This latter has been planned by FOTA (Friends of the Theatre Association) and takes the form of a superb concert celebrating the 30 years since the Salon Varietes became the only English-speaking theatre in Southern Spain. Full details will be given later. PS Some important info: BOX OFFICE TEL: 952 474 542. Open 11am – 2 30pm Mon to Sat and an hour before each performance. ALLO! ALLO! Don’t miss this hilarious comedy based on the famous BBC sitcom of the same name. 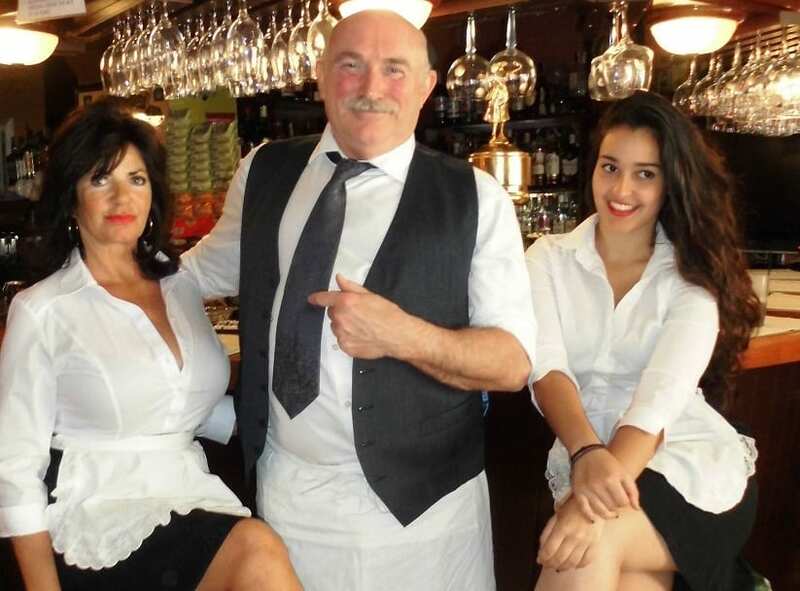 With the unmissable, unmistakable, irreplaceable figure of long-time Salon favourite, Francis Butler, playing the key role of Rene, and Special Guest Star, Hannah Murray from Talk Radio Europe, as Helga!….. plus all your other Allo Allo favourites – not to mention a certain sausage…oh, la, la! This show is a rib-tickler magnifique! Mais oui, m’sieu! At the Salon 10 – 15 April. Directed by Peter Brooks. PS Don’t forget to keep an eye on the website and the Facebook page. That way you won’t miss a treat as sometimes things happen at the last moment.